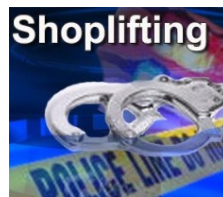 HAYS -Two Kansas women were arrested over the weekend in connection with a number of thefts at Hays retailers. According to the Hays Police Department, Roberta Tonya Gonzalez, 43, and Angie Pilar Parra, 30, both of Dodge City, were arrested and a juvenile was taken into custody Sunday evening at Hastings Entertainment after they were identified in a string of shoplifting incidents at the entertainment store. HPD Lt. Brandon Wright said at 6:13 p.m. Sunday employees from Hastings reported the women, who had had been identified as suspects in previous thefts at the store, were in the store. The women had been identified on security cameras on multiple occasions, and the police department is investigating five more cases they believe are connected. The initial estimated value of the items stole from Hasting was $1,700, according to Wright. During a search of the suspect’s vehicle, officers reportedly found a significant amount of stolen items, valued at more than $1,800, that allegedly had been taken from eight other retailers in Hays. Following the arrest, the juvenile was handed over to a relative. Officers continue to investigate similar cases they believe could be linked.